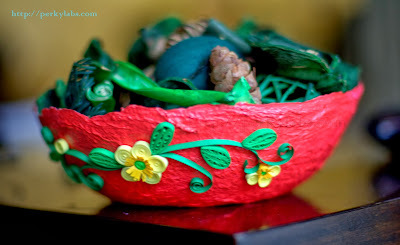 This Paper Mache bowl is made with my own Paper Mache recipe. This recipe did not contain any chemical or glue. Fenugreek Seeds paste is used to keep the bowl in a stable shape. Its very earth friendly and non toxic. Take a mould ( any plastic container of your choice what ever the size you want) apply a plastic sheet or foil around the bowl. On top of the palstic sheet apply the paper mache paste 1/2 inch depth. make sure the applied paper mache is equal on all the parts of the mould. Place the mould in shadow, where you get more air flow .Make sure the side where the paper mache applied is up. 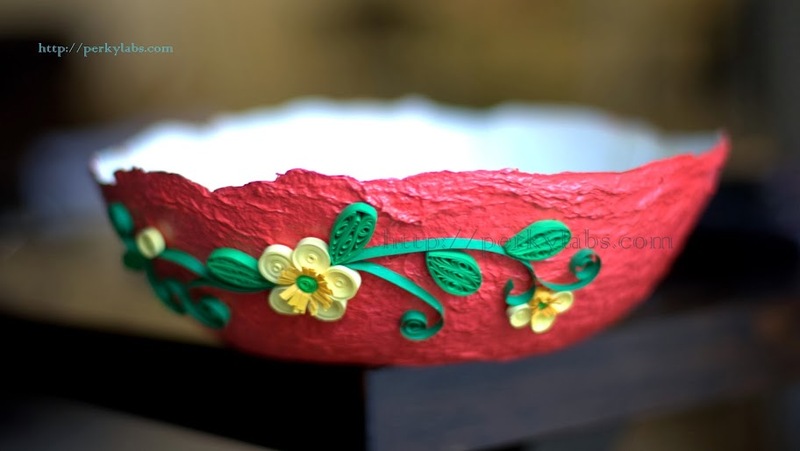 After drying in a shadow 4 to 5 days the paper mache bowl will detach from the mould. remove the pastic warp carefully and keep it in same place for 1 day. Before going for any decoration on it make sure it dried completely. After it dried had a coat of white color, then 1 coat of varnish. Dried it in shadow for 2 days. After it dries very well , Painted outside with metallic red acrylic color. Then Glued Quilled Flowers and leaves.